Sometimes I wonder what becomes of my socks and mitts once I release them into the wild. While I do wonder about the socks and mitts that other people produce from my patterns, in this case I'm speaking specifically about that small group of finished objects that I've knit with my own hands and sent abroad. I am not in the regular habit of knitting and selling finished goods -- when I do, they are only specially designed for and sold at one special shop -- but from time to time I have knit for select others. But what becomes of those things once they reach their final destination? Sometimes I never find out...and then sometimes...I do. You recall the socks I knit for Thomas, yes? Well, they've long since gone to live with him and recently they joined him on his tour of Southeast Asia. 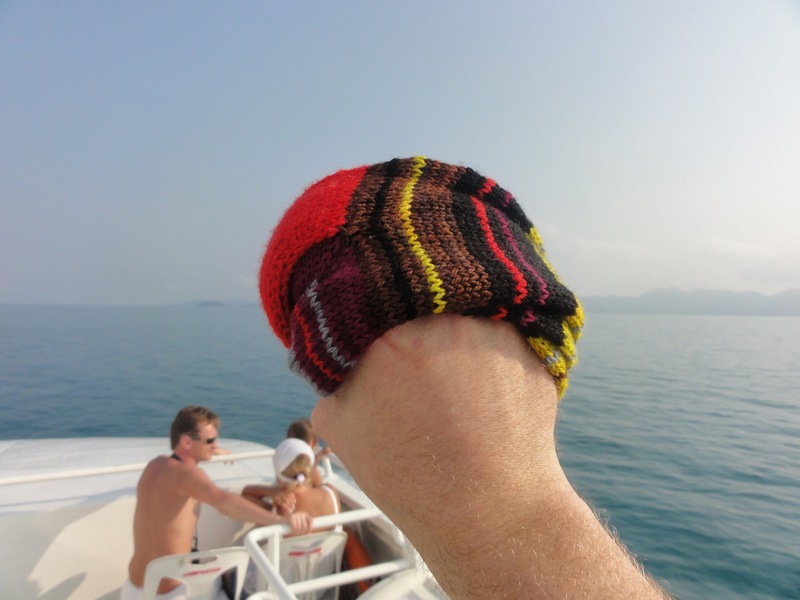 Here are the socks behaving recklessly (but clearly enjoying themselves immensely,) aboard a boat with Thomas in sunny Thailand: Lucky socks! Look at the colour of that water! Hang on socks! Don't let go! Something tells me that these might be the only handknit wool and silk socks in all of Thailand...or, failing that, the only handknit wool and silk socks in all of Thailand being brandished by a DJ/musician/producer and all-around very charming dude aboard a boat...in March. Many qualifiers; one very happy pair of socks. One very happy sock recipient. One very happy sock designer/knitter, happy to see that her socks are making people who make her happy happy. what great photos!! looks like you (and the sock!) had an awesome day on the water. March 28, 2011 at 10:22 a.m. I love seeing the things I've made being used or worn by their recipients...this is awesome validation for what you do! And, not only are they possibly the only wool/silk blend socks in all of Thailand, they are the first, and only, pair of socks to ever make me wish I, for just a moment in time and space, were a sock, too! March 28, 2011 at 12:37 p.m.
March 28, 2011 at 3:38 p.m.
Really cool! Great to know he enjoys the sock love. March 28, 2011 at 5:37 p.m.
Yeah, spread the love! 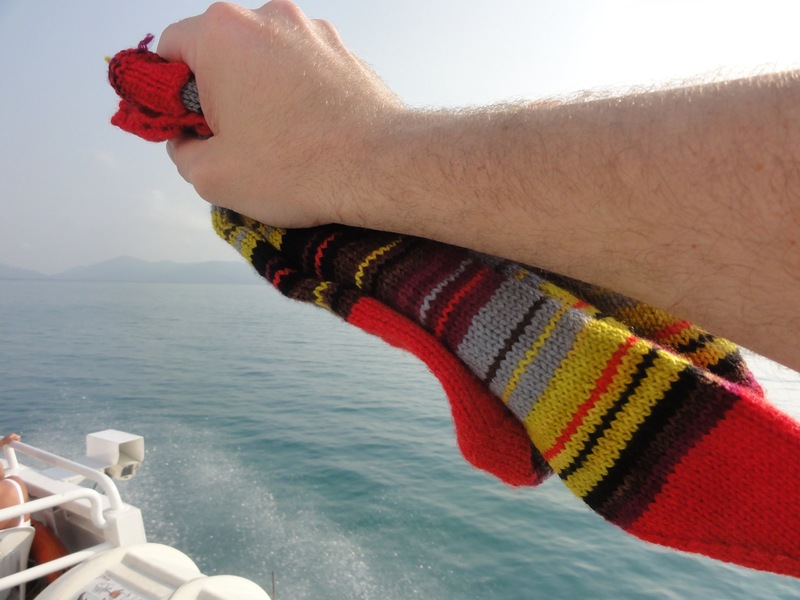 It is indeed nice to see what our handknitted gifts become! March 28, 2011 at 9:21 p.m.
March 29, 2011 at 2:28 p.m.
Just discovered the blog and reading back entries. "Socks with Pints On" gave me a hint, but the Pearwood spindle (non sapient) clinches the deal. Have you ever thought of translating Captain Carrot into socks? I'm sure he's from Sackatchewan - same big farmboy size and deadpan delivery. March 29, 2011 at 10:51 p.m.